Nick was back in the pulpit yesterday after three weeks in different pulpits or just spectating. Great to be back in Romans in the morning, and we started looking at Islam in the evening class - their history and beliefs. Quite interesting. After the PM service we had a small gathering; Liz and I needed to put songs together for the upcoming Ladies' Retreat (which has now been postponed until November), so she and Graham came around with chicken and rolls, along with Justus and Andreas. Had a play through the music we selected - I reverted to guitar with Liz on organ and Justus, although neither a lady nor a camp musician, filled in the blanks on my violin. Nick, Graham and Andreas went off to the lounge for some serious conversation! 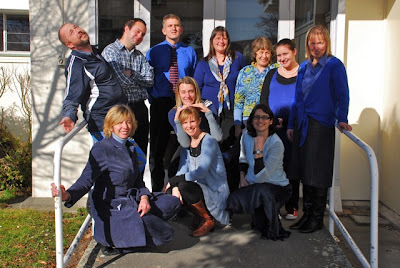 Monday, all the staff were blue (not a reflection of attitude, mind you!). I don't think the kids caught on as quickly, if at all, as when we did the purple and green days as a lot of staff tend to wear blue anyway - of course now if Mr Goulet had kept his blue pyjama pants on all day it would have given the game away!